In August, Drum Corps International will welcome Patria Drum and Bugle Corps to the Open Class Championships in Michigan City, Indiana. Not only is this Patria's first journey to the United States, but this dynamic marching ensemble from Guatemala will be among the first Central American groups to participate in a DCI event. Patria's 105 marching members and 45 staff will travel nearly 2,600 miles to present their 2014 program, "Todos es Posible," which translates to "Anything is Possible." The show highlights the real life challenges of growing up in Guatemala, and encourages the country's youth to seek positive opportunities. "Kids in Guatemala often grow up in poverty and as a result of that environment, make poor choices that can lead to substance abuse and gang involvement," said Gabriel Estrada, director of Patria Drum and Bugle Corps. "We want to inspire them to turn their lives around, showing them that anything is possible with effort. " 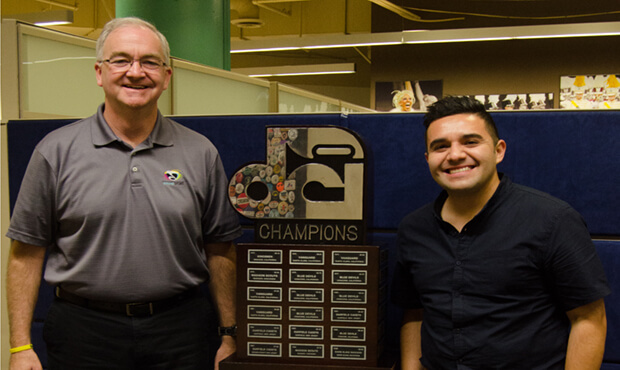 Drum Corps International has a strong influence on the marching music activity in Guatemala, but not everything is the same. For example, while the DCI Tour lasts primarily three months of the year, ensembles in Guatemala rehearse all year round, two hours a day. "School here ends at noon, so students go home, eat, come back around 3 or 4 p.m. and then rehearse," said Estrada. "Everyone's houses are close by, so there's no need for members to travel far to participate. Most marching ensembles in Guatemala start as part of school programs, typically by students who share a passion for music and the marching arts. This common interest unites students and alumni alike who work together to organize rehearsals and handle the logistics of competition. 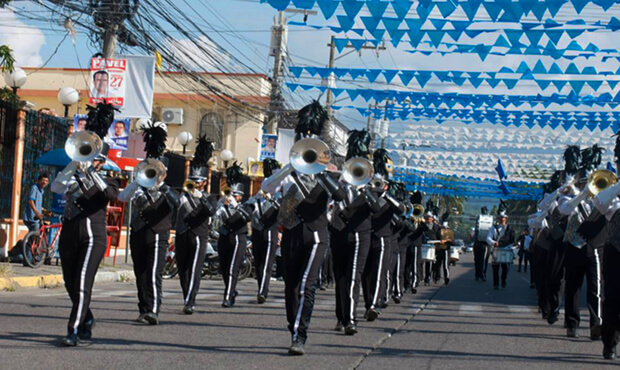 In 2012, System Blue and the Blue Devils Drum and Bugle Corps traveled to Guatemala to perform an exhibition at a local marching band competition and host an educational clinic for local musicians. For Patria, this was the first exposure they had to a drum corps from the United States. Estrada remembers that visit from the Blue Devils as greatly influencing his decision to bring Patria to the United States. "We are looking forward to sharing our culture and bringing a piece of Guatemala to the United States," Estrada said. "After seeing the competition here, I hope that our students will come back motivated to push themselves to become even better musicians." Between securing passports for 105 members, working through the logistics of transporting instruments thousands of miles, and raising the funds to make this trip possible, Patria has faced many challenges. "It is hard, coming from such a long distance to perform, but the opportunity is worth it and the members are learning so much," said Estrada. "We are really living out our show by participating in this DCI event, proving that with effort and determination, anything is possible." Patria will arrive the first week in August, and will compete in the Open Class Prelims and Finals events on August 4 and 5. After that, the corps will travel to Indianapolis where they will experience all the sights and sounds that World Championships Week has to offer. Learn more about Patria Drum and Bugle Corps.